The Pearly Clamclamp (ヤマシンジュ?, lit. : "Hill Pearl"; just Clampshell in the European version of New Play Control! Pikmin) is an enemy in Pikmin. This large bivalve has a pinkish shell and inside, a small pearl surrounded by a clear blue membrane. 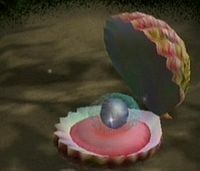 When Pikmin are thrown on it, they will attack the membrane to try to take out the pearl. The enemy's only defense is acting like a Venus flytrap: the Clamclamp will stretch its mouth wide open, creaking like a poorly-oiled hinge, and chomp. Before it does this, one needs to call the Pikmin so they won't be eaten. This is obviously a very simple predatory tactic for the creature. After being delivered, the pearl gives fifty Pikmin. If the Clamclamp is on land, two bomb-rocks can also be used for a quick and easy kill. This creature is one of the two second leading creatures in Pikmin production, succeeded by the Smoky Progg and tied with the Armored Cannon Beetle. Oddly, the Clamclamp has been known to take slight damage for a short time after the Pikmin have been called back, meaning that if the creature is already near death, the player can simply withdraw their Pikmin and the Clamclamp will die on its own. The creature cannot truly die, and will continue to attack even after the object on top of it has been removed. The following stats apply to the pearl only. The enemy as seen at The Impact Site. They only appear in The Impact Site. There are three, all of them on the beach area at the northwest. One is submerged in water, and has the Positron Generator. Another is in a small island in the pond, and the final one is on the beach itself, to the north of the area. These are the locations of the Pearly Clamclamp in Challenge Mode. These places are in specific hard to reach places and surrounded by enemies. The Forest of Hope: one where the Radiation Canopy is in the main game, and another where the Burrowing Snagrets are in the main game. The Forest Navel: where the Libra is found in story mode. The Distant Spring: where the Massage Machine is, where the Gluon Drive is, and where the Chronos Reactor is, in the main game. The first and most dangerous way to defeat this enemy is to gather about 20 to 30 Pikmin and throw them into the mouth of the Pearly Clamclamp, then when the Pearly Clamclamp starts to open its mouth wider, call them back. The second and easiest way is to gather up 2 Yellow Pikmin, get them bomb-rocks, and then throw them at the Pearly Clamclamp at a reasonable distance. The third way is probably the most time consuming, but is the best for zero death challenges. Bring about 5 Pikmin (any type for Pearly Clamclamps on land), then throw 3 to 5 in the mouth. When the creaking sound of the Clamclamp stops, call the Pikmin back. Repeat until the loot comes out. Note that it can still attack after its pearl has been taken out. With enough throwing speed, it is possible to defeat the enemy in a single cycle (i.e. before it closes its shell the first time), although this is mostly only feasible in tool-assisted superplays. There is only one way to kill a Pearly Clamclamp with Olimar alone, and only one location in the whole game. Go to The Distant Spring in Challenge Mode. Then, go to the area where Submerged Castle is in Pikmin 2. There is a Yellow Wollywog nearby. Lure it right next to the Clamclamp, and lie down right next to it. After a few attempts, you'll be in the Clamclamp. It will try to shut on you, like if you were a Pikmin. Attack the pearl with your leader's punch then lay down if the Clamclamp and/or the Yellow Wollywog tries to attack. If you successfully do all these tactics, you will have defeated the membrane surrounding the pearl. Then get out of it, as the enemies will still try to attack. It was originally thought that this could only be done on the New Play Control! version of Pikmin, but it can be done on both games. Its name consists of the word "pearly", referring to the pearl it normally holds, and a combination of the words "clam" and "clamp", "clamp" meaning "to crush and squeeze". In the European version of New Play Control! Pikmin, its name was changed to simply "Clampshell", for unknown reasons; this name is merely a combination of "clamp" and "shell". Its Japanese name is ヤマシンジュ?, which translates to "Hill Pearl". 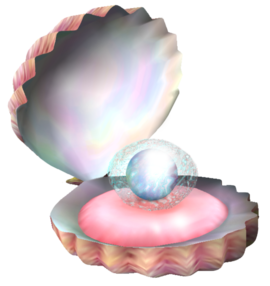 Internally, this enemy is simply called shell, and the pearl is called pearl. Alternate artwork with the Positron Generator. Interestingly, when its pearl comes out it makes the sound the Honeywisp makes when hit, and a spirit floats up, yet the creature is still alive. It is the only enemy that has a ship part that is visible before its death. This is the only non-boss enemy in "Pikmin" not to make a return in "Pikmin 2". This page was last edited on January 27, 2019, at 14:55.